I love Greece and every year, when summer comes, I think about it and how much I would love to go back! So I try to sunken myself in Greek recipes! 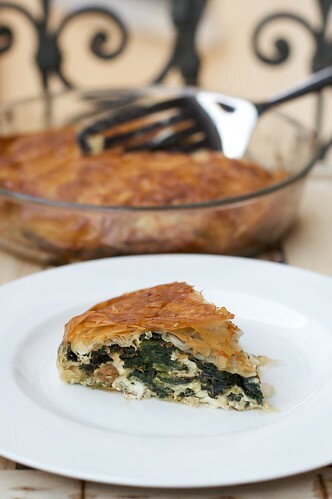 This combination, feta cheese and spinach, just scream Greece, and the fillo pastry, with its crunchiness is perfect! Finely chop shallot or onion. In a big pan fry the chopped shallot or onion, then add all the spinach: it will look like too much, but believe me, they will fit once cooked. Cover with a lid. After a few minutes, when spinach are reduce, add raisins and cook for few more minutes. Remove from the eat and add pine nuts. In a bowl mix spinach, crumbled feta and 2 eggs. In a sauce pan, melt the butter with the milk. Let it cool. Brush the bottom and the sides of a cake tin with some butter and milk. Open the fillo pastry, take 4 sheets and let the rest under a damp tea towel. With your 4 sheets, cover the bottom and the sides of the cake tin. Add half of your spinach, cover with more sheets of fillo pastry, add the rest of the spinach. Fold all the over layer of fillo pastry inside your cake tin, add two more sheets and fold them to fit the size of the cake tin. Brush with loads of milk and butter.